Offerman is an accomplished entertainer known for Parks and Recreation (2009), The Founder (2016) and Fargo (2014). 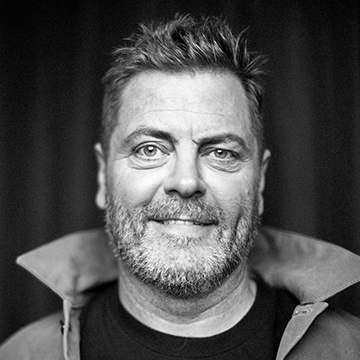 His role as Ron Swanson in Parks and Recreation, earned him a Television Critics Association Award in the US for Individual Achievement in Comedy. He is also a two-time nominee for the Critics' Choice Television Award for Best Supporting Actor in a Comedy Series. His first major television role since the end of Parks and Recreation was Karl Weathers in the acclaimed series Fargo, for which he also received a Critics' Choice Television Award nomination for Best Supporting Actor in a Movie/Miniseries.